One of my favourite things about Autumn (and believe me, I have plenty of Autumn favourites) is seasonal spices. 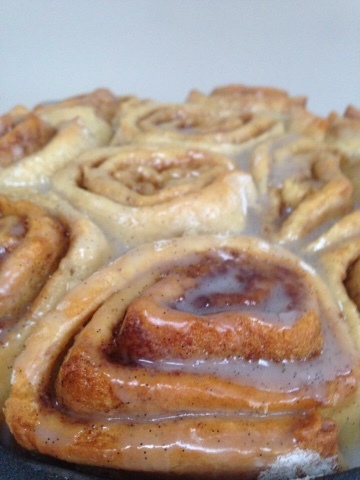 Be it in candles, Pumpkin Spice Lattes or, in this case, cinnamon rolls, I just can't get enough! Warm spices just make me feel so cosy and always help me to get in the festive mood as Autumn becomes Winter. As a vegetarian, I always like to try alternatives to animal products. In fact, I often prefer the alternative - almond milk is far preferable to dairy milk for me and I've even fallen for a dairy free ice cream! I decided to step it up and try to make some vegan treats from scratch. I was somewhat nervous about how my rolls would turn out but thankfully they looked and tasted great (if I do say so myself)! 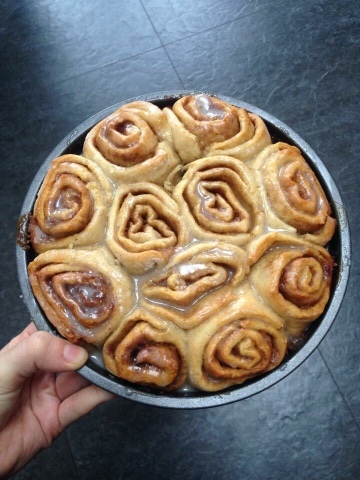 The cinnamon rolls even got the thumbs up from my non-veggie and vegan family members so they're a must try - even for those of you who love animal products! To start, pre-heat your oven to 180 degrees Celsius. Then pop your almond milk in a pan along with three tablespoons of your butter substitute and keep on a low heat, stirring regularly, until the butter is fully melted. Once off the heat, transfer to a mixing bowl and let the milk and butter cool until warm, then add the yeast and leave to activate for ten minutes, add one teaspoon of sugar and stir. Now begin to add your flour a little at a time, stirring as you go. Once all of your flour has been added, transfer the dough to a floured surface a knead. Once your dough is a relatively loose ball, coat your mixing bowl with flour and place the dough inside. Cover with a damp towel and leave in a warm place to rise for around an hour. In a new bowl, mix together your remaining sugar with your cinnamon and mix a few drops of vanilla extract with your remaining butter. Once your dough has doubled in size, place it onto a floured surface and roll out into a rough rectangle shape. First spread your dough with your vanilla butter mixture and then sprinkle with your cinnamon sugar, finally, drizzle the dough with golden syrup and roll! Cut your long roll into relatively equal pieces - you should end up with between ten and twelve rolls. Just before cooking, grease your tin of choice with some dairy free butter, and then place your rolls inside. Your rolls should be in the oven for around 25 minutes. Whilst your rolls are cooking, it's time to whip up the super easy glaze that no cinnamon roll is complete without! simply place your icing sugar in a bowl and add your almond milk one tablespoon at a time - the glaze shouldn't be too runny! Finally add your glaze to the rolls when they're hot from the oven. Serve warm with a cuppa (of course)!